December and January along the Goseong county coast between Daejin and Geojin in Gangwon Province often provide some of the best gulling in Korea and perhaps anywhere in East Asia, with huge concentrations of gulls feeding on fish egg-cases. This included more than 4,000 Slaty-backed Gulls along this stretch of coast in mid-January 2017. 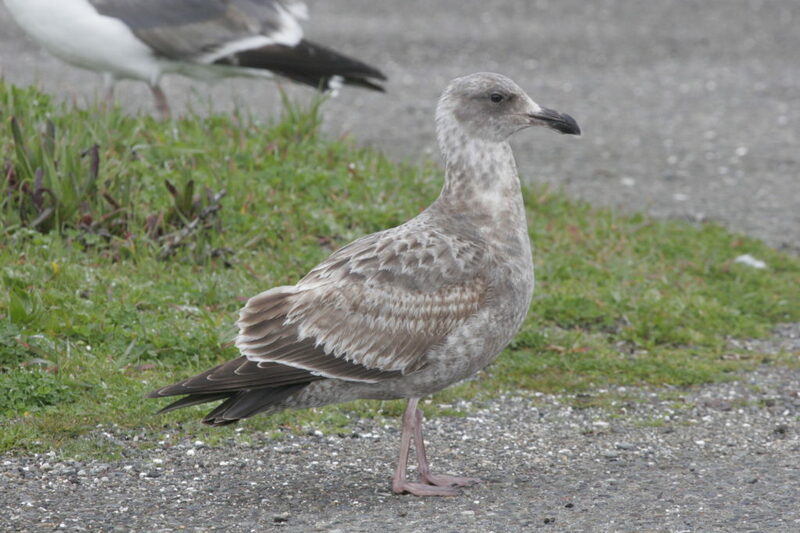 On January 25th, Team Zoothera was checking through a flock of 1,000 or so large gulls loafing on the beach next to the Daejin lighthouse when I noticed a much darker grey, brown, black and white First-winter with a strong grey wash on the head and underparts – immediately recalling Western Gull Larus occidentalis (WEGU), a North American species. 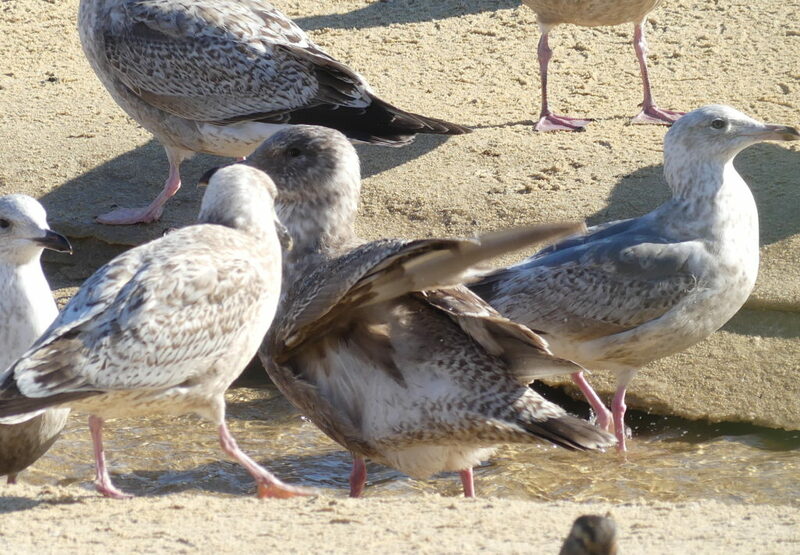 Closer examination of this individual, seen at less than 30m range pushing agressively through a dense crowd of similarly-aged Slaty-backed L. schistisagus (SBGU) and Vega Gulls L. vegae, suggested multiple additional pro-WEGU features, including a grey-masked look and a heavy grey wash on the flanks (the former distinctive feature often suggested by Glaucous-winged Gull L. glaucescens, GWGU; the latter feature in East Asia shown only exceptionally by large gulls, and that by presumed hybrids with some SBGU and/ or GWGU influence); a streaked crown; brownish wing coverts; an all-dark looking blackish tail; extensive replaced grey on the upperparts, more extensive than expected in SBGU, with some internal streaking; and blackish primaries with apparently dusky-washed undersides. 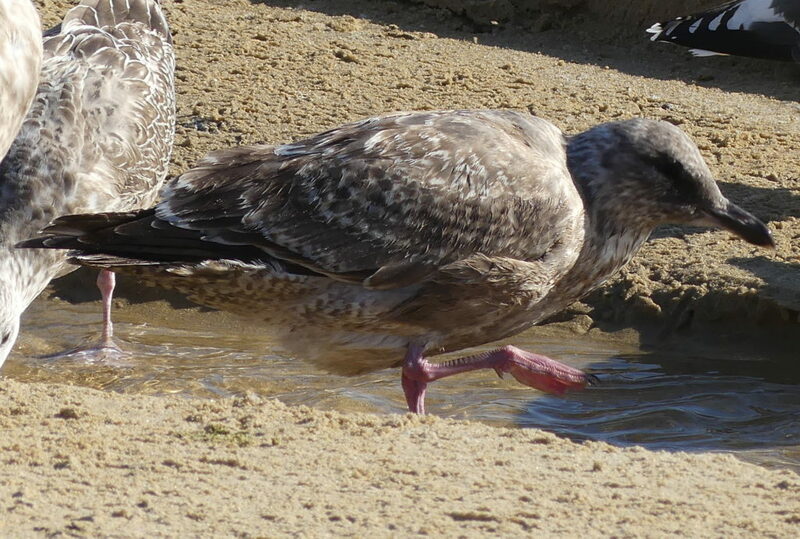 The legs also showed dark scutes. I was already well-aware of the importance of many of these ID features because of extensive discussion with lead ornithologist Peter Pyle and Tristan Mckee and review of multiple images following my discovery of a somewhat controversial First-winter WEGU two years earlier further south along the coast in Gangneung City. 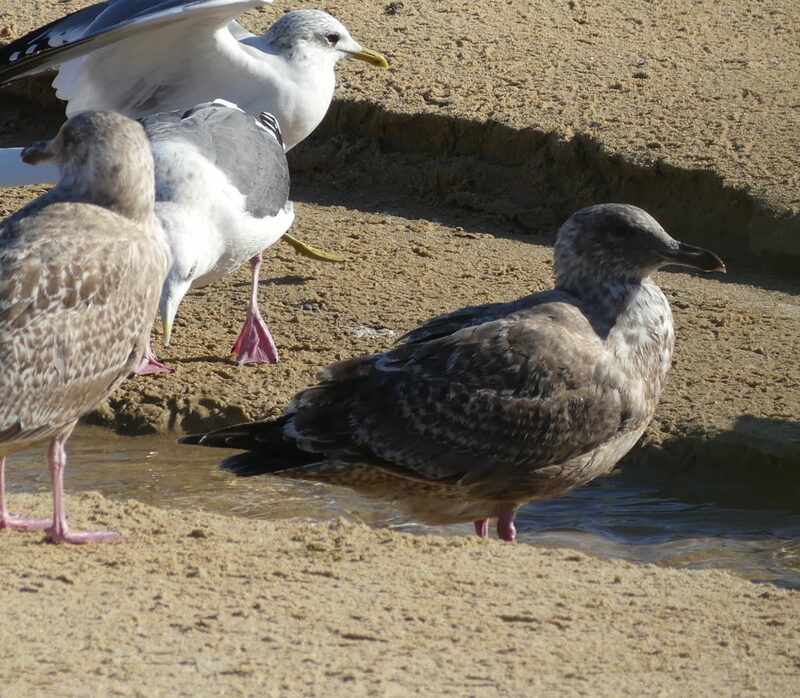 And I had not knowingly seen another gull showing anything close to this combination of features since that time – despite checking carefully through many thousands of SBGU and Vega Gulls. With a mixture of incredulity, excitement and a growing sense of deja vu, I therefore encouraged the rest of the team to “Get on this bird as quickly as possible!” and to try to take record shots. The light was extremely bright, and Nick Upton and I had to take our images through some narrowly-spaced green railings before most of the gull flock took flight (and we also had to leave to take a boat). 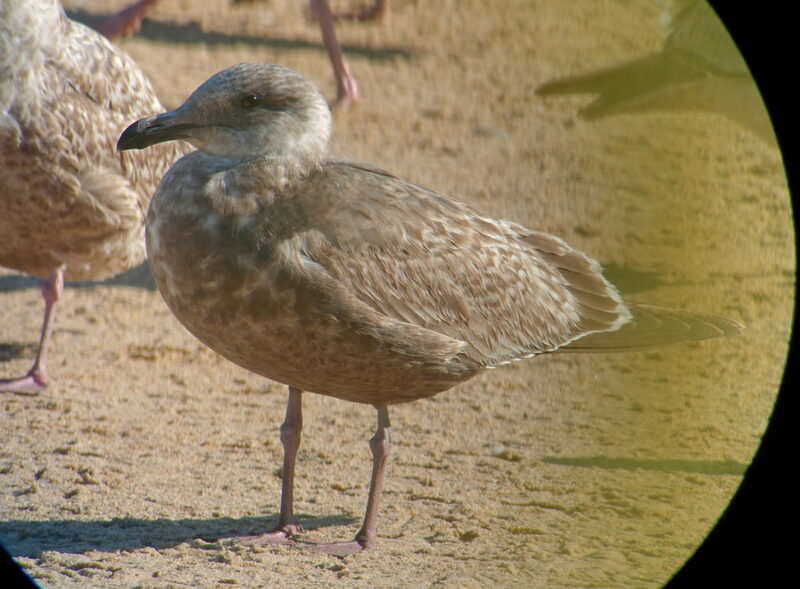 Western Gull Larus occidentalis, Daejin Beach, Gangwon Province, January 25th 2017, © Nial Moores (top two images) and Nick Upton (bottom two images). All images cropped but otherwise unaltered. In the field and later that evening when reviewing our images, multiple features still seemed to both NM and NU to be well beyond the expected range of SBGU or Taimyr Gull L. heuglini taimyrensis. We also could not come up with an obvious hybrid combination that might reasonably be expected to lead to such a striking WEGU-like bird either. Fairly content with the ID as a bird that looked to contain at least some WEGU influence, I therefore sent the link to a hastily-composed blog post with a couple of my images of the gull to Peter Pyle and asked if he might be willing to share his expert opinion on the identification. 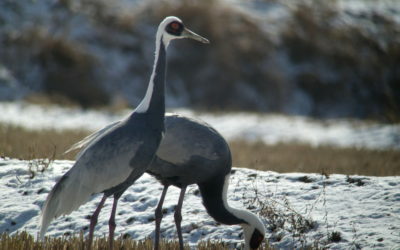 Initially expressing doubt about whether the bird “was big-billed enough or had formative back feathers that matched those of first-cycle WEGU“, three additional images taken by NU (as above) were added to the blog post. These looked rather more convincing. 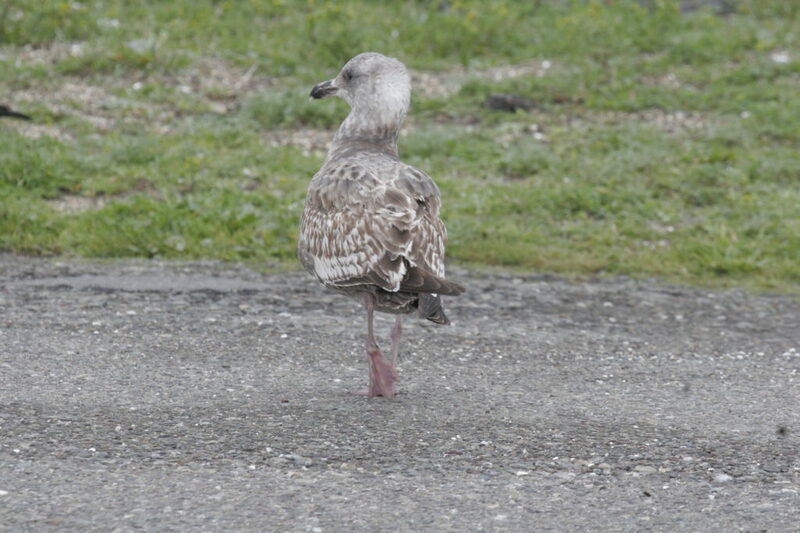 PP was soon to lead a class on gull identification on the California coast; and would use the opportunity to look even more closely at and to take images of local WEGU. On February 7th, PP kindly shared some of these images. 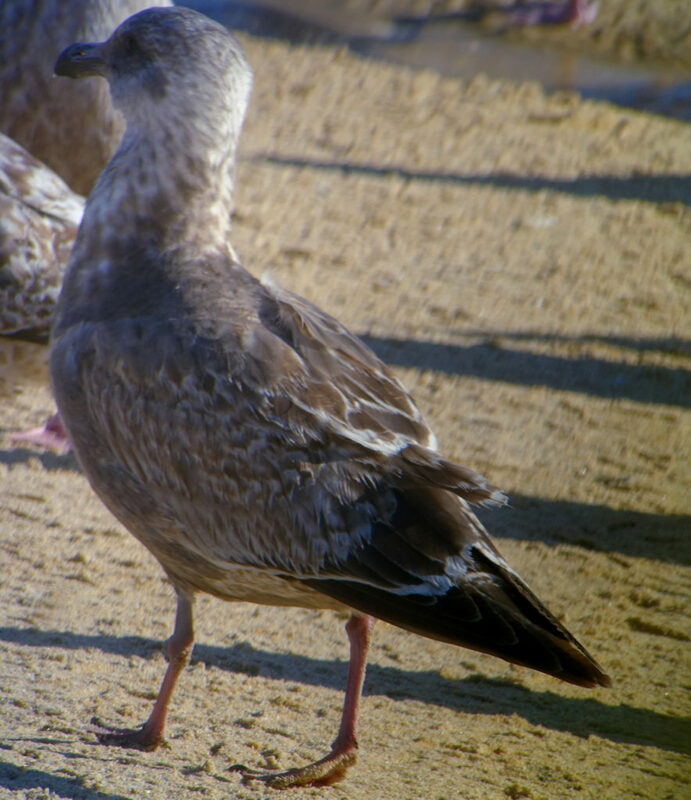 Composite of images of First-winter/ Second Calendar-year Western Gull (and one hybrid WEGU x GWGU in bottom row, right end), Bodega Bay, California, taken on February 5th 2017 © Peter Pyle. Western Gulls ##4 & 6, from the composite above: Bodega Bay, California, taken on February 5th 2017 © Peter Pyle. The Daejin Beach Western Gull, January 25th 2017, © Nick Upton. Image cropped but otherwise unaltered. Note the similarity in primary projection; bill shape; grey mask; grey wash on upperparts and underparts; tertials, tail and coverts etc. With sincere thanks once more to Peter Pyle for generously sharing his expertise and images (and for his corrections to the text); and an open invitation to experienced gullers for their informed input and opinions.